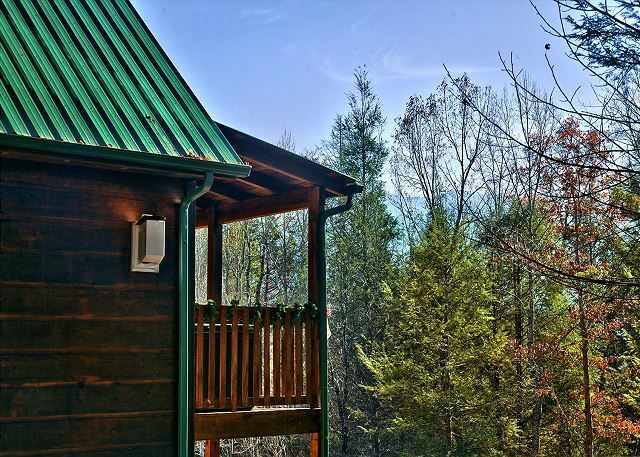 This cute 2 bedroom, 2 bath cabin is located within walking distance of Gatlinburgs historic Arts & Crafts Community and trolley stop. Enjoy... VIEW NOW. 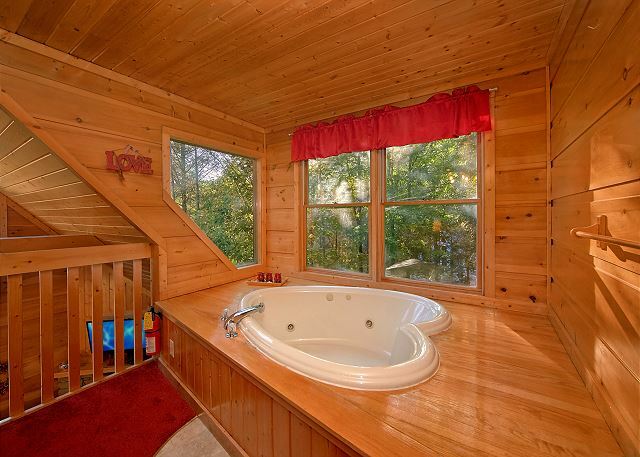 Always Misbehavin is a charming one bedroom, one bath cabin with mountain views and seclusion, making this a great choice for a honeymoon or romantic getaway. The king size bed and indoor jacuzzi are a couple's treat! For those chilly nights, get warm and cozy while snuggling up by the fireplace. Take a moment to wind down and settle into the hot tub for a quiet evening or share in a friendly game of pool. 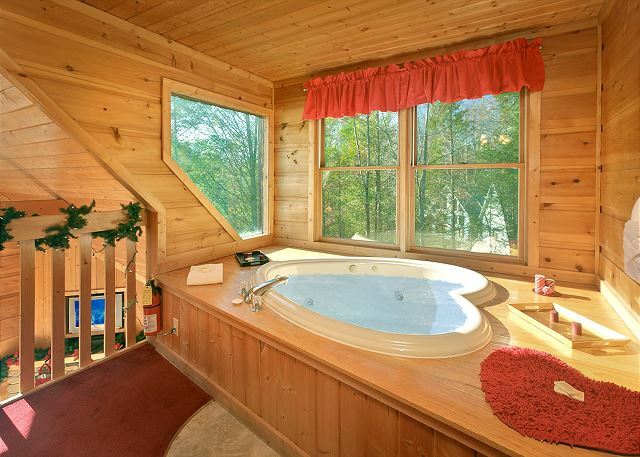 This is the perfect cabin for those who are "Always Misbehavin." Price is based on 2 adults, each additional adult is $12.50 per night. We rent a cabin every year for our vacation. This was by far the best experience we have had in the last few years. The cabin was clean, the view was amazing, and the bed was the most comfortable one we have had. They even called to check on us and make sure we were enjoying our stay! We loved our stay! The cabin and service was great. The only thing we didn't like was there was no internet but it wasn't a big deal. We would still go back again. Had a great time, great location, wonderful amenities great! We had a great stay in a beautiful cabin. The customer service representatives were more than helpful. We will definitely rent from Aunt Bug’s again! This was our first time visiting Gatlinburg. My spouse and I both commented that it was better than we had expected! Beautiful views, close to town and the national park. The hiking trails were superb. It was peak for the colors of fall. The cabin was conveniently located and had great a great view of the mountains. We will be going back! My wife and I were looking for some quality time together away from Florida. I came across Aunt Bugs Cabin Rentals and loved the options. Although a little skeptical at first we were very pleased at the ease of reserving and checking into our cabin. The cabin was very clean and relatively easy to find being that both of us were unfamiliar with the area. Looking forward to our next vacation. We loved our stay! The cabin was beautiful, and pretty decently off to itself. It did have a lot of squeaky noises at night. The pool table was at a awkward angle didn’t really have room to play. Also the tv was in a bad spot. We spent most of time at the cabin so these were points that were a down fall but if you don’t plan on staying in then it probably won’t be a problem. I would love even more if there was a pool access. Aunt Bug's cabin was great, everything was accurate with the pictures posted online, and it was a great place and close by to great smoky national park (20 minute drive). The only issue we had was that when I booked it, I was waiting on the answers of 2 other friends. The description said "additional adults are $12.50 per night" so I assumed this was okay. I then got the go ahead from my friends that they would be coming on the trip and I called to add the adults as the description said that I could, and then they proceeded to tell me that it was not possible, that the cabin is only meant or 2 and I was not allowed to cancel or switch to a different cabin that allowed more people. I purposely booked this cabin so that I could have more people as the description said I could. We loved every aspect of our trip. From initial greeting at Aunt Bug's to every store employee we shopped. All were extremely friendly. Only problem experienced was that we had no hot water upon arrival. A breaker had tripped in the locked basement. A maintenance man showed up the next morning as promised. There is no blame to anyone for this happening. It just happened to be bad luck for us. It could happen to anyone at anytime, anywhere. We will use Aunt Bug again!! The cabin was quiet and remote, but still close to town. Everything was provided that we needed during our stay. Was a nice getaway. Easy check-in and check-out. Had a great time will stay with aunt bugs rentals again. Great little cabin. Perfect for the two of us. Easy access to cabin. Just close enough to Gatlinburg. My husband and I arrived in Pigon Forge earlier the expected. We stopped to check in at Aunt Bugs thinking we would have to wait to get into the cabin. The cabin was already cleaned and read to go so we got in early which was very nice. The cabin itself was very clean and had every thing we needed pot, pans, towels etc. We stayed for 5 nights and had a great time. We had a great time. The cabin was perfect! 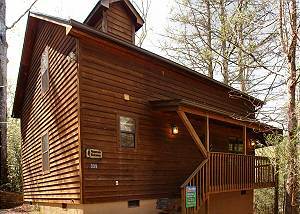 Wonderful getaway, peaceful, private and convenient to nearby shopping if you want to leave the cabin. Want to suggest: directions off the main road need to be updated,cookware needed replaced,and we could not find charcoal for our grill. We Loved every other feature and the time relaxing by the inside fireplace after using the hot tub. This trip was for my honeymoon and I had a blast staying in my cabin. I felt right at home by all the amenities. 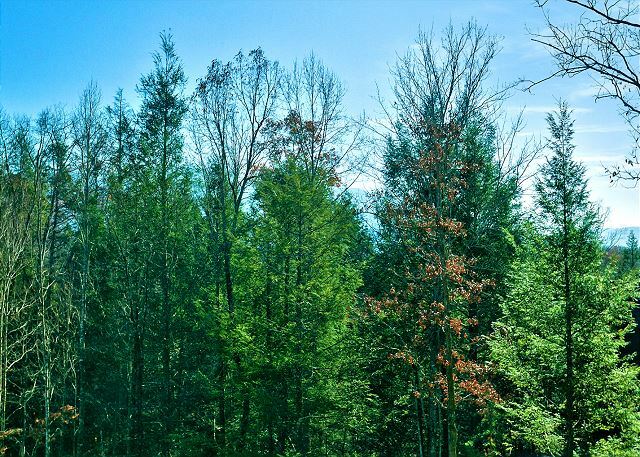 The property was clean and the location was with in 5 miles from Downtown Gatlinburg, TN. I checked in after office hours but the staff there were nice, professional, and understandable. Go check Always Misbehaving cabin for your next vacation stay. Very nice cabin! Checkin/out very easy. Staff was great. The cabin was great for the most part but did not have wi-fi access and the billiard table was falling apart. But overall it was a great experience and would highly recommend. Great for couples ? Cabin & property were clean & had everything that we needed for the 3 days we stayed.The only thing I had a problem with was the worker bee's that had made a home in the bottom of the swing on the deck. Beware of the bee's! Loved it. Beautiful, great location, hidden in the trees. Will rent it again. Beautiful cabin. Very quiet and relaxing. Perfect location for all our needs. My wife and I enjoyed our stay very much and would recommend this cabin. The Christmas decorations was nice. It could use a swing or some chairs on the deck to sit on. Wonderful cabin set up and location. The cabin was absolutely perfect and the most beautiful view of the mountain. It was so nice to wake up to such a beautiful view. Enjoyed how close it was to Gatlinburg. Wish it was more secluded but overall had an awesome weekend with my fiance! A great location for a secluded getaway weekend. We LOVED the cabin and wooded area. Gatlinburg was fun to explore as was the National Forest. But staying at this cabin was very relaxing and a vacation we will never forget. We will definitely be back. Thank you for the hospitality. We stayed here 6/26 to 6/30. We absolutely loved this place! It was very clean - smelled fresh and was well kept and updated. The staff was friendly and helpful. It is privately located and convenient to the downtown area which we utilized for our meals as well as to the trails we were hiking. Beautiful cabin, super clean, and everything we were looking for. Great vacation cabin! The only thing we wish we could have had was more scenic views. View wasn't horrible, but another cabin right in the view. Overall, great place to stay and very convenient location. The cabin is great for 2. Other than some housekeeping things, our stay was nice. Something you can't get from pics on the website is that this is one of several cabins on a street, not as much privacy as we thought we were going to have. We had a wonderful time at this cabin during our stay in Tennessee. It was secluded but close to town to do sight seeing. The cabin was always misbehaving. It was beautiful, loved the scenery and the outside grill and fire pit provided. Also the pool table and extra games were awesome! Great, had a good time. We will be coming back next year. The cabin was excellent. Great service. Everyone was nice and helpful! The place was clean and just perfect for our romantic honeymoon! Thanks for the great experience we will be staying here again!! Amazing! The cabin was super clean and the service was great, the kept in contact to ensure we were happy. Overall was great,directions need upgraded,business that is used as a landmark to turn off rt 321 is no longer open,no sign etc,also a little lock box explanation would be nice,cabin had two lock box,s of course the combination we were given only works on one of them. very clean, the only issue we had was the A/C unit wasnt working when we arrived but was fixed with in an hour. Great cabin with great features! Cozy and had everything we needed. Everything was great! We can’t wait to come back on our next trip! Cabin was well maintained and made stay enjoyable. I would prefer to have wireless in the cabin and hope on future stays it will be added. The pre and post communication about stay was top notch...best I have seen in all of my rental and travels. Coupons are nice touch for the surrounding area. We LOVED our cabin and thank you for letting is book one night! My husband and I really needed a little getaway. The hot tub and pool table were great!! We enjoyed our stay in the cabin. It was very clean and well equipped. We would like to return someday and rent a larger one and bring our extended family. Check in was a little rushed. Cabin was fine and clean. Wish map for cabin was a little more detailed. We were looking for a cabin as a last minute get away. The staff was very help full in finding us a cabin. The cabin itself was very nice, was very clean, and had everything we needed for a nice. Thank you! Y'all made us feel like family check in and checkout was so easy. everything was perfect. We loved three location. The accommodations were incredible and we enjoyed the games that were available. If I had to list one thing (And it was the only thing) that was not up to par, it was the comforter on the bed. It was disgusting, so we washed it. It honestly surprised us being that the rest if the place was so immaculate. We would love to return to the cabins with our children. Cabin was great. Birds in roof or under deck were annoying at night. TV upstairs only worked on channel selected on main TV. Everything else was great. We stayed at the cabin Always Misbehaving, me and my boyfriend loved it. Very comfortable and secluded. Will most definitely stay again. Everything was above and beyond what we could expect for our honeymoon! The cabin was great. The directions to the cabin were awful! A detail of looking for "McCallisters Grill" and turning left after the particular business, McCallisters Grill is no longer in business. When mentioned to the staff at aunt bugs, we were told "oh yeah, they went out of business 2 years ago." When making that a big detail of the directions and the business is no longer there, (in an area where GPS doesn't work) it's kind of a big deal. Great, I had a very good time, and found every one very friendly. Easy check in and out process. So many coupons! The cabin was super clean and nice! Overall a great experience. Cabin was very nice , clean and organized. Only thing was check out did not work from my phone. Everything was great. Service of getting the cabin was excellent. Recommend to anybody. Overall it was a great weekend and a great cabin. The heat was a bit lacking for a cold winter weekend, and the hot tub had no instructions to operate it, but otherwise a great time. Booking the cabin was stress free. Our stay was relaxing and very enjoyable. I arrived 30 minutes early too check in, the cabin was ready. Upon arrival.I was happy to find the cabin clean and stocked. We rent from AUNT BUGS. Up to 6 times a year.We have not been let down...Thank you Aunt Bugs..We Will be checking back with you Guys Next Month! Very nice staff, very courteous. Only wish there had been wifi in the cabin. Otherwise, it was a great experience. Good setup in cabin, everything was very clean, good location. Location was great, the accommodations were good, the cabin was clean and enjoyed our stay. We enjoyed our stay with you. The only problem we had was the worker bees in the swing on the deck. We had an awesome trip to The Great Smokey Mountains. Our stay at the cabin was very pleasant and comfortable. The office staff was very friendly and helpful.